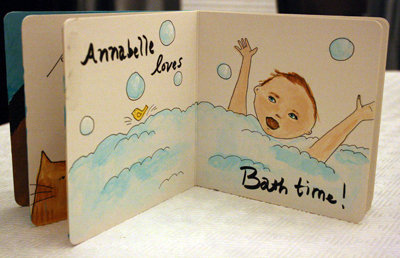 Today, I finished up the cover and the bath time page for Annabelle's book that I started a few days ago. I read her the first few pages and she seems to like it! I also worked a little bit on the larger painting I started on day 1. I also want to share a bit of creativity from my family history. My grandmother made this sweater for my future child, before she passed away and before her Alzheimer's disease got bad. I didn't know about it until my mom gave it to me at my baby shower last April. Today we put it on Annabelle and it fit perfectly. Thank you, Grandma! We love it! Aw happy girl! This makes me smile. The sweater is perfectly awesome! Annabelle has so much to treasure. Both are so sweet. What a wonderful gift from your grandmother and what a wonderful gift you have created for Annabelle. What wonderful treasures you’ve shared with us today – Thank you! No wonder she is smiling in that sweater! She is wrapped in love. The yellow on the cover makes me think of the yellow sweater. Your book is beautiful and Annabelle is too cute for words! What a precious gift that sweater is, as is your hand made book! 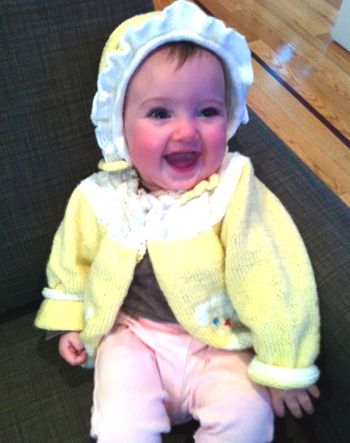 What a lovely story about your Grandmother making the little cardigan….Annabelle looks so cute wearing it too. Sweet book and extra sweet sweater. 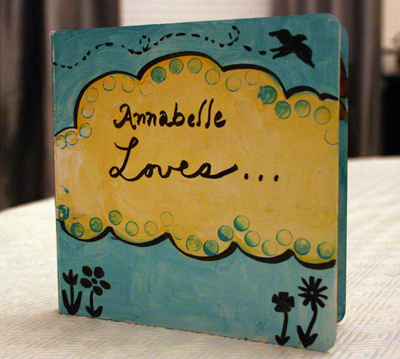 Annabelle is so lucky to have an artist Mom, expecially one who does artwork just for her! I love it. Your little Annabelle is adorable…definitely an inspiration for creative fun! That book is going to be her favorite thing in the world! I haven’t been able to participate much in CED this year as I’ve been working on a couple of really big projects – but I have still been creative every day! Annabelle is getting so big! Your little book for her is gorgeous, and I hope that after she has finished chewing on it, it will still be something you can keep for her to treasure for ever, The story about your grandma is so lovely. You must have been so surprised and touched when your mum gave you the little cardigan that she had kept a secret all that time. Annabelle looks adorable in her special gift from Great Grandma. I love the book! AND the outfit your grandmother made is so special! How wonderful. Oh it’s so nice to see the book emerging from your magic hands! And the sweater story is so moving, grandmothers are full of surprises… I am so sure that wearing that sweater will cause Annabelle and your grandmother to bond deeply beyond the limits of this life. May she see her lovely great-granddaughter from upon her star today! I love how this book is progressing! It looks like it’s going to be precious to the both of you! I dig these blank board books and love how yours is coming along. I want to do one WITH my son when he gets a bit older.